We all know what happens from here….nothing good. G-d says, “You have seen what I can do and you still doubt me! The very thing you rejected because of fear, I will give to your children.” Fear. Fear is what kept that generation from entering the Promised Land. 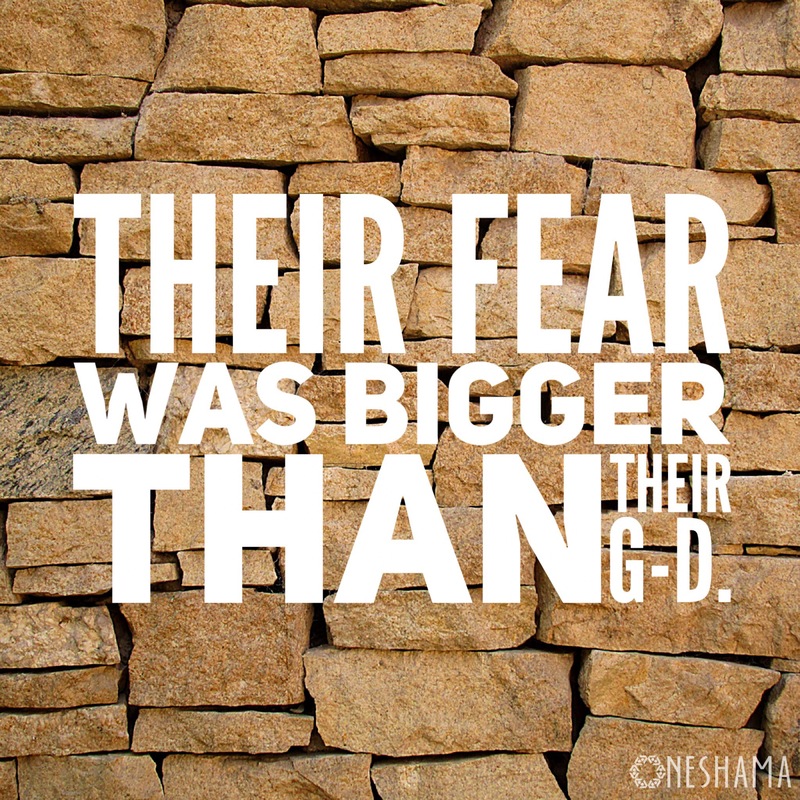 Their fear was bigger than their G-d. Despite walking on dry ground through the sea and numerous other daily and monumental miracles, they did not trust G-d to go before them and accomplish what he had promised to them. I’m sure many of you have heard rabbis or preachers or even friends say, “Don’t be afraid of the giants in the land!” Of course they use this very incident in the Bible to make the point that we should not fear what lies ahead because G-d will make a way. I, however, am super realistic. If it was so difficult for them to trust in a G-d that had delivered them from Egypt when they saw his countless grand-scale miracles, how likely is it that we will struggle to have faith in G-d? Highly likely! What is the key to having an unshakeable faith? 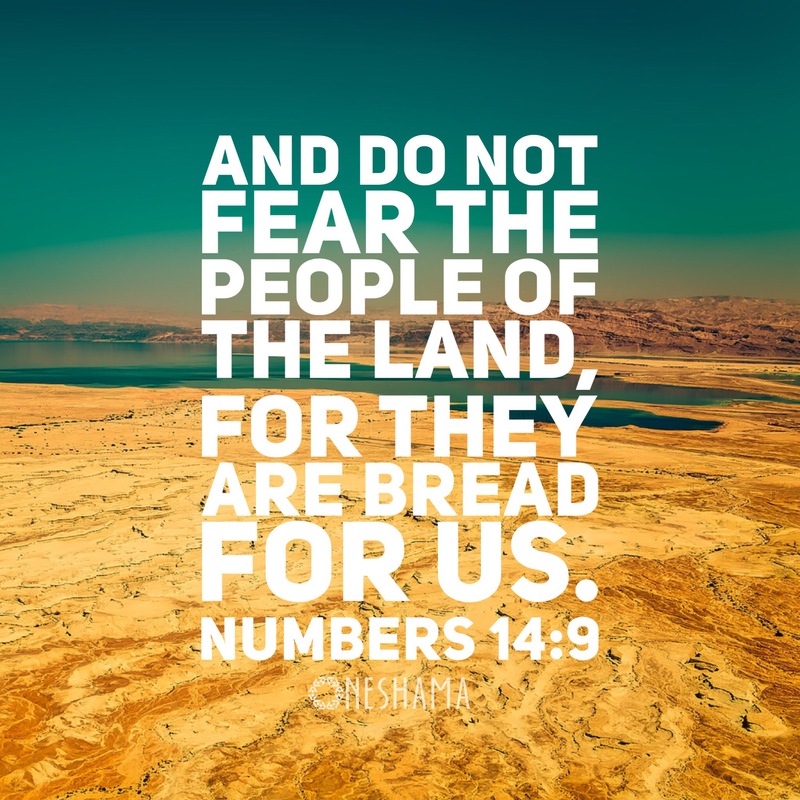 How do we get to the place like Caleb and Joshua where we can scoff at the idea that the giants in the land are insurmountable and declare that “they are bread for us”? I want that!!! Don’t you?! I think the key is hidden in a small verse, tucked away in the Torah. Everyone always talks about how G-d would speak to Moses face to face, and the Bible makes a point to tell us this on various occasions, but this one mention is made of Joshua’s time with G-d. One single solitary line of the text holds the key to Joshua’s faith. “Joshua…would not depart from the tent.” For as much time as Moses spent speaking with G-d face to face, Joshua spent even more time in G-d’s presence. The key to faith that is limitless (Matthew 17:20) is proximity to G-d. There is a direct correlation between the closeness of our relationship with G-d and the “size” of our faith. When we are distant from G-d, it allows fear to take root. We put G-d in a box, and the creator of the universe is no longer capable of the impossible but hemmed in by what we think is conceivable. As we spend more time with G-d, as Joshua did, we know and understand the power and might of our creator! We realize that what we can imagine or plan is nothing in comparison to what he puts into motion. (1 Corinthians 2:9) We are surrounded and inundated with his presence and glory and it crowds out the doubt and fear. If you want to have faith that can move mountains, you must get closer to G-d. Take G-d out of the box that your fear and doubt has placed him in. Suspend disbelief when he shows you the impossible. Devote more time to knowing and understanding the awesomeness of G-d. (Start by reading the Psalms!) Take a page from Joshua’s book; don’t be so quick to leave G-d’s presence and rush on to the next thing. 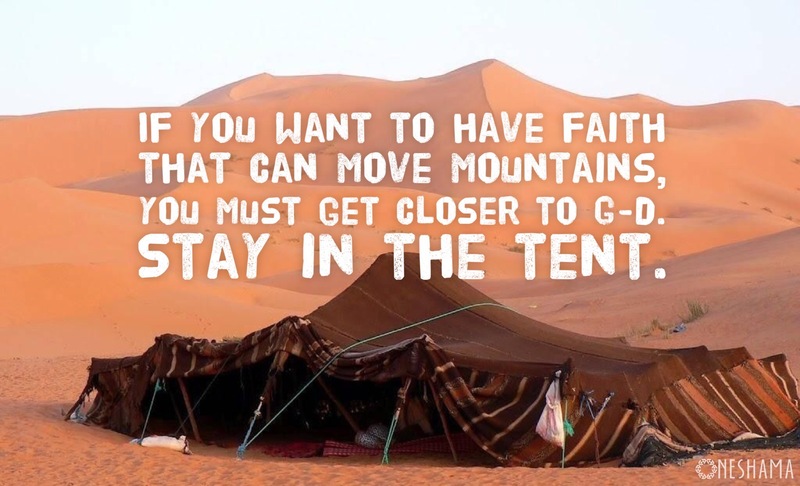 Stay in the tent!